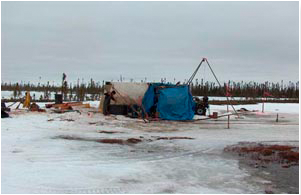 The Attawapiskat project is comprised of 2 separate joint ventures. Metalex has a 80% contributing interest in the Big Red Joint Venture and a 82.5% contributing interest in the Dumont Joint Venture. Both interests are subject to a net carried interest in favour of Kel-Ex Development Ltd (7.5% in the Big Red JV and 5%-7% in the Dumont JV) These Joint Ventures control a total of 162 mineral claims totaling 306 km2. there are 21 known kimberlite pipes in the region, 16 contain diamonds and at least one is commercial (Victor). this high percentage (76%) of diamond bearing pipes far outweighs the global average of 14%. 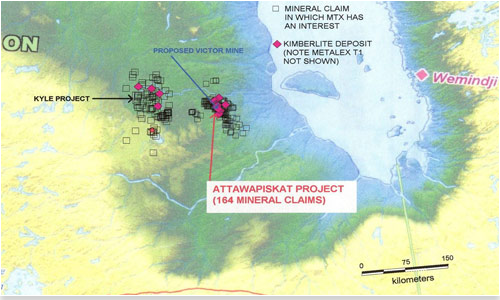 this demonstrates the Superior Craton in the Attawapiskat Region to be especially prospective for diamonds. the known kimberlite pipes were discovered by drilling aeromagnetic anomalies. Some kimberlite pipes, and these may be the most productive, may not be detectable by aeromagnetics. Attawapiskat is located in one of the deepest parts of the lithosphere within the Superior Craton. the exploration target is low magnetic commercial grade kimberlite pipes that intrude the sedimentary cover. these can be explored for by basal till sampling for diamond indicator minerals and follow up of diamond indicators discovered. 21 kimberlite bodies discovered, 16 diamondiferous. Victor (owned by De Beers) is commercial – 30mt at $90c /t. diamond value exceptionally high (approx us$ 300/ct). 15 ha, multiphase. grade about 25 – 28 cpht. atleast one other kimberlite (Tango) might be promising (De Beers have carried out bulk sampling). aeromagnetics flown over an area of 6.676 km2 more than 100 anomalies followed up by auger sampling. helimagnetics and electromagnetics flown over 6,000 line km, several anomalies found. high counts of fresh (near source) diamond indicator minerals found over an area of 3.6 by 3.8 km (D6 diamond indicator fan). several diamond indicator sites and aeromagnetic anomalies outside the D6 fan remain to be investigated. targets secured with 164 mineral claims. located about 10 km south of the proposed Victor diamond mine, within a “kimberlite corridor”. 694 basal till samples collected by power augering; 692 samples contain kimberlite indicator minerals and 631 contain diamond indicator minerals with good mineral chemistry. many diamond indicator grains are fresh and angular and are considered close to their source. diamonds found at four locations. the source(s) of the diamond indicator minerals has not yet been found. 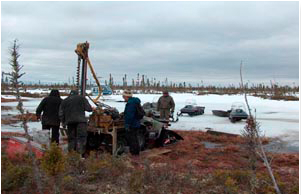 tracing the best of diamond indicator grains back to their individual sources by auger sampling and drilling. 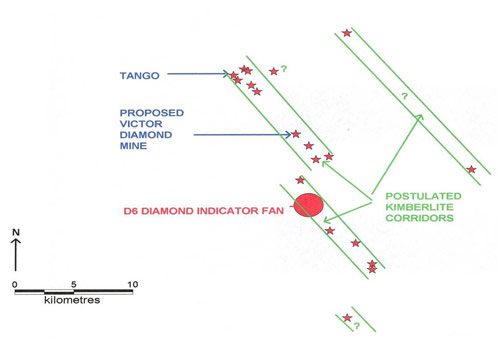 follow up of other priority diamond indicator and aeromagnetic anomalies outside the D6 fan.